This is me, when I had hair, doing one of my first readings. Last year I was invited to do my first public reading. Before anything, I was really excited, but I am also very much like a chihuahua, so that was immediately followed by extreme nervousness. I had so many questions that I felt dumb asking anyone. What should I read? How long should I read for? Should I read prose or poetry? Can I even be in the bar where I’m supposed to read (I was 20 at the time)? If you’re about to do your first reading, you might be having the same sorts of questions, the same jitters. WELL I’M HERE TO TELL YOU THAT YOU DON’T HAVE TO LIVE LIKE THAT ANYMORE. Because I have some tips that I’m going to throw at you with no particular system of organization. Practice reading out loud before the reading. This is a good way to get a feel for how much emotion you want to put, or not put, into each piece. It’s also a good way to weed out those words that you never realized you’ve only read in your head and you’re not sure how they sound (ie. “pumice.” Is it pyoo-mus or puh-mus? We may never know) so you can get that nice robot voice to help you. Take more pieces with you than you think you’ll read. It’s good to have more than you think you need to give yourself some room. Sometimes you can get a feel for the mood of the room when you’re reading and you might decide to switch up your next pieces. I’ve done this almost every time I’ve read. Q: What should I read? A: It really depends on the nature of the event. For example, I recently read with the Poet Laureate of Indiana (not bragging or anything) for National Poetry Month. Because of the occasion, I only read poetry. Likewise, at the Ball State Literary Death Match, it was a little more open so I read poetry and prose. Mostly though, just read things that you are proud of and want to share. Q: How long should I read for? A: Superb question! Again, this depends on the nature of the reading. If there are a bunch of other readers, try to keep it fairly short. If there are less people, you have a little more time. Sometimes the host might tell you how long to read for. When I opened for the Poet Laureate of Indiana (I guess I am bragging a little), I was advised to keep it at about 10 minutes. Generally I just leave the podium after a big applause because it feels like the audience is enthusiastically herding me off stage. Q: Should I preface my pieces or introduce myself? A: This is entirely up to you. Sometimes someone will introduce you before you read, but you are still free to throw in a little something about yourself if you really want. And if you feel the need to preface a piece you’re reading, go for it. If you think it adds to it to say, “This is a poem about how I broke my whole leg. Here it is,” then you just go right ahead and do it. For the love of Steinbeck, don’t apologize for what you’re reading. Please don’t do this. If you don’t seem jazzed about your work then neither will the audience. You’re obviously talented enough to have been chosen to do a reading, so just own it. If you’ve written something really angsty, read it. If you’ve written something about horses, read it. If you’ve written a manifesto about leaf blowers, read it. There’s no room for self-deprecation here, not in my house (or whichever house it’s being hosted at). Be sure to thank the people who hosted the event and the audience. Being invited to read at a public event is a really great experience, and anyone who supports it is a literary citizen. And we all know that they’re the coolest cats. Doing a reading will make you feel like a superstar, and they’re great to put on your CV. If any of you want to share your experiences or your own tips, or if you have any questions that I haven’t answered, feel free to comment or tweet them with the hashtag #litcitizen. One series that I loved with all of my heart was A Series of Unfortunate Events by Lemony Snicket. 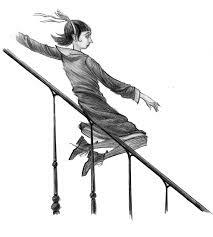 What made it so great was that Violet Baudelaire, the oldest, was a girl like me and she was the one who was generally in charge, saving the day, fixing everything. As a kid who was also, incidentally, a girl, and someone not very in control of the events in her life, this was the coolest of the cool to me. I gobbled by way through the entire series and then started looking for others like it. What I found was a little disappointing. Most other books had male protagonists or were about things that didn’t interest me. I found one book with a woman in high heels, one leg cocked, holding shopping bags and decided to give it a shot. In one of my classes, some guys behind me saw the cover and started snickering. I was so embarrassed that I walked back to the library with it tucked under my arm, cover hidden, and turned it back in before I’d finished it. Laurel Snyder really does a better job of talking about this in her article than I do, but more or less the problem was that, despite the wonderful worlds that books could offer me, the culture surrounding them was making it hard for me as a reader. That was a really roundabout way to get to my point. What I mean to say is that books shape us. The things we read growing up teach us how to think and feel about ourselves and those around us. The books that we read now can open our minds to new ideas or teach us about things we might otherwise have never encountered. Why then couldn’t I find more books about women that didn’t make me feel ashamed to be seen with, or why did they have to be something I should have felt ashamed of in the first place? I know that those books are out there, and that people are out there who wouldn’t laugh or turn their noses up at certain genres. I think it’s our duties as readers and writers to help people find those books, and to recognize how important they are. So what are some books that you needed and didn’t know about? What are some books that you had that helped you figure things out? And how are you making sure that other people know how great they are? Feel free to share your suggestions either in the comments or on Twitter with the hashtags #litcitizen and #THATbook, or follow @litcitizen (on tumblr too) where we will be posting ideas of our own.